John and I voted in our local election this morning. We were voters #2 and #3 in the big echoing hall of the Methodist Church down the street. It was carefully set up with five voting booths and four friendly precinct officers. The officers sat side by side along a table, ready to check in voters. They check and recheck and get signatures and cross off names. But they are not required to ask for ID. That is ridiculous. It makes me mad every election. I had the opportunity to work as precinct officer during the last presidential election, and the potential for fraud made me simmer all day long. It still makes me mad. I’m a pretty honest person and here’s my story. About 15 years ago I found out that I don’t have a middle name. I always thought I had one, and I used it and I believed it was official. (I have no idea how that first official document with a stated middle name came into being.) But then, for some reason, 15 years ago I needed to have a certified copy of my birth certificate and discovered that I do not have a middle name. I was glad because I didn’t like the name very much, so I set about the process of removing it from documents and records. Easier said than done. One of the things I did was re-register to vote, changing to my name to the new version sans the middle name. 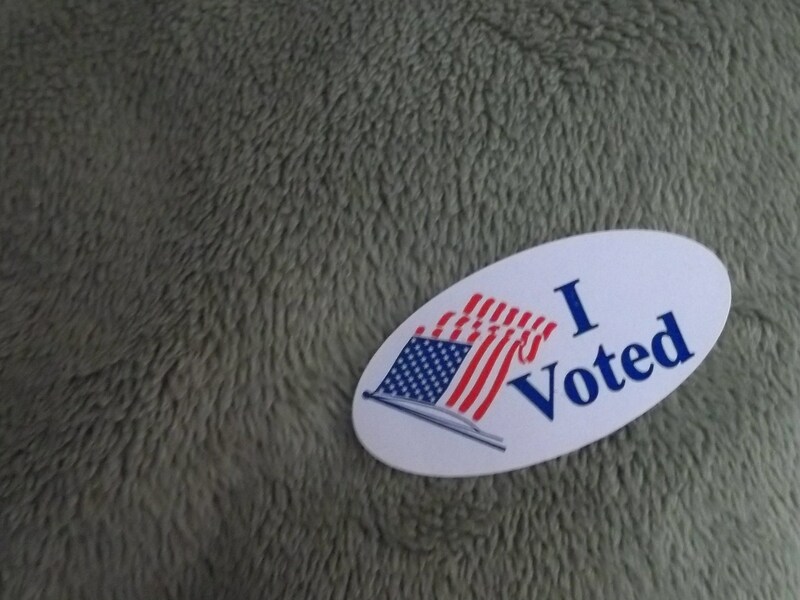 Election day came, and off we went to the polling place. My name was listed – twice – once with the middle name and once without. I told the election officers and they tut-tutted about the oversight. When I got home I called the registrar of voters and was told that they would fix it. The next election I was still on the books twice. Again I called the registrar of voters. “You can’t do that!” he sputtered. I explained the problem I was having, and had been having, for the last three elections. Somehow that day, those precinct officers managed to take care of the duplication. Since then we have come to know our precinct officers pretty well. They always recognize us. Now they know our name, and they know our kids and we always chat for a few minutes. By now I guess they know that there is only one Andrena Paladini in this precinct, but I still wish they were required to ask for a driver’s license or some kind of ID. Categories: Soap Box | Permalink. I stood at the Lincoln Memorial, rooted in place. The reason I was rooted in place is because my feet were stuck to the marble floor by about four layers of spilled soda, and who-knows-what-else. It was a far cry from the shining monument Mr. Smith visited when he went to Washington. 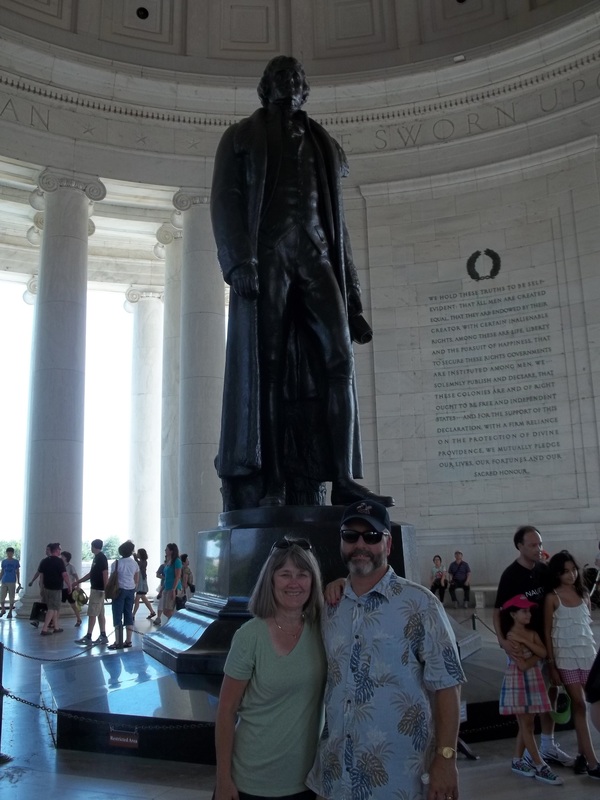 It was even a far cry from the Lincoln Memorial our family visited on Monica’s eighth grade school trip. As I stood there facing President Lincoln I had to struggle not to cry. I was overcome by a wave of desolation and hopelessness. I don’t base my hope on the government or Washington D.C. — Of course I don’t! But I had been looking forward to a patriotic “shot in the arm”. All my life, my heart has lifted at the sight of our flag waving, or the sound of our national anthem being well sung or played. I had told Monica and Dan that I didn’t really care what kind of “touristy” things we did while we were in Maryland– it would all be fun! But the one thing I really did want to do was go to Washington D.C. I didn’t want to tour the Smithsonian Museums because I knew there wouldn’t be time to do them justice. I just wanted to walk around D.C and bask in the greatness of our heritage. We did walk around D.C. Oh yes we did! Dan retraced our steps later on Google Maps and we walked more than seven miles around the city that afternoon. And speaking of walking, as we walked along I kept sort of tripping on the brick pavement. After I had stumbled three or four times my family began to look at me askance. Then John tripped. Then Monica. Then we saw a man prying up bricks. He might have been hiding a geocache, but he looked more as though he was searching for spare change. At any rate, we finally understood that we were tripping, not so much because we’re clumsy, but because the bricks get pulled up, and then they are not set precisely back in place. For the most part, it was a fun day. 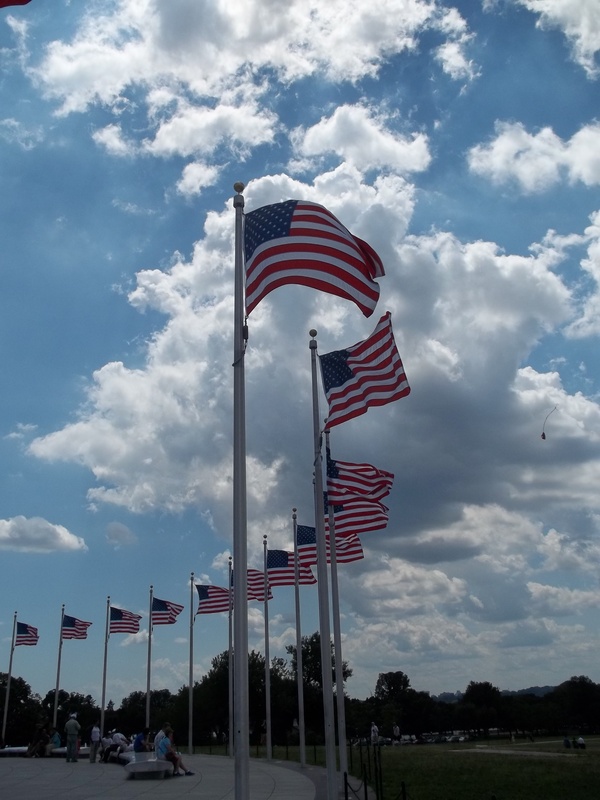 There were great high points like the well-maintained Viet Nam Memorial and the beautiful new World War II Memorial. 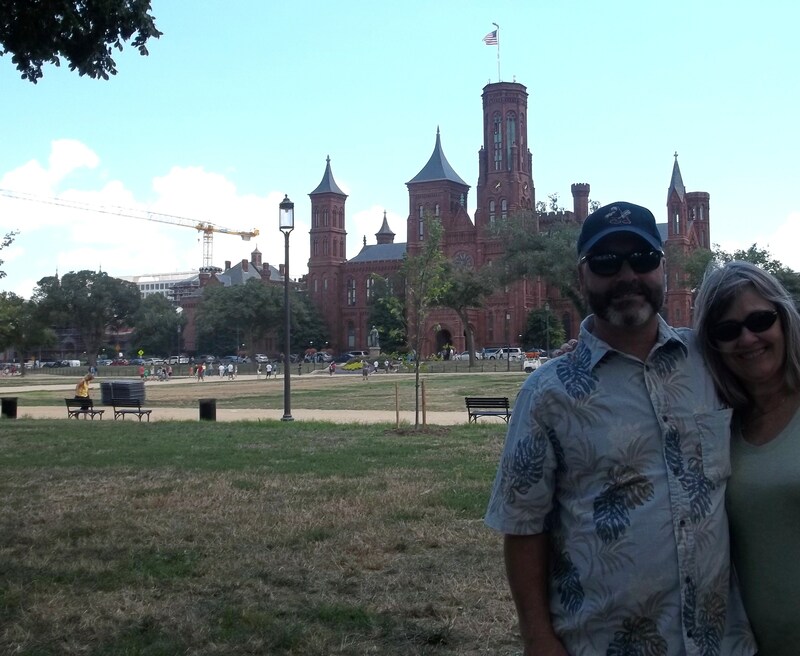 But the National Mall, and surrounding areas, felt like an inner city slum. It broke my heart. As I looked at all the tourists from other countries I wondered what they must be thinking. The grass was brown and dying. We had visited Gettysburg National Park a few days earlier and the grass was luscious and green. We went to several neighborhood parks in Maryland and the grass was rich and beautiful. The Spilmans’ own yard had a lovely lawn. 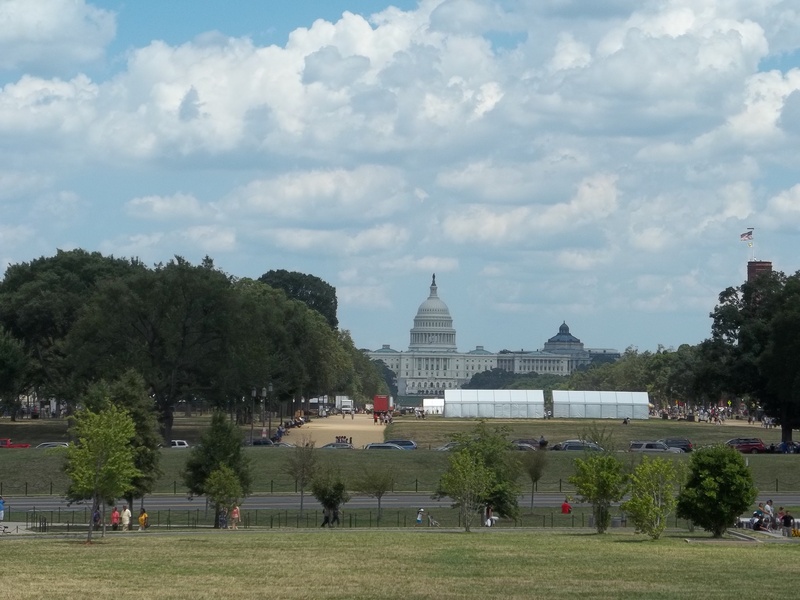 But the grass on our National Mall was sparse and brown. Now desolation vied in my heart with anger. If there is any place in our country that should be well-cared-for, it should be our Nation’s Capitol. 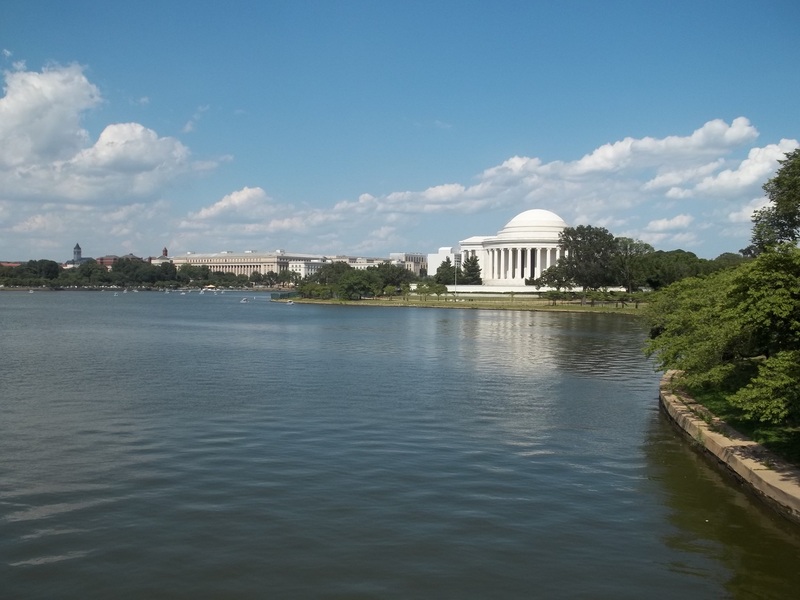 Perspective returned to me as we crossed the river to the Jefferson Memorial. The grass was greener and the memorial cleaner. My heart rose as I looked up at the statue of the man who penned so many of the great words of our American heritage. America was founded on great and godly principles, and I’ve come home determined to pray for our country and our leaders; and to do what I can to work toward a return to those principles. Categories: Soap Box, The Sauce Thickens | Permalink.